Archive by category "National Papa John’s News"
The Johncol, Inc. franchise group in Columbus and Central Ohio has won the Central Division Large Franchisee of the Year for 2013. It is the third time over the last five years that Johncol has received this honor. Johncol will compete with three other Division winners this March for the national title of “Papa John’s Large Franchisee of the Year”. Johncol won the prestigious national award in 2010 and hopes to repeat the accomplishment. “We are proud, honored and humbled to once again represent the Papa John’s Central Division on the national stage” said Charles Burris, Operating Partner for Johncol, Inc.
Just in time for National Cookie Month, Papa John’s, the Official Pizza Sponsor of the NFL, today is introducing Papa’s NEW Chocolate Chip Cookie. 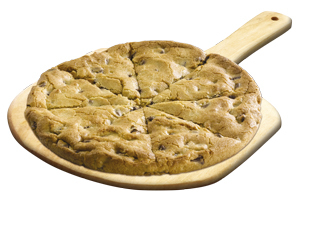 Mega-sized, filled with rich chocolate chips, baked fresh and cut into eight slices and served warm, Papa’s family sized Chocolate Chip Cookie is just $5 with any pizza purchase, now through Oct. 27. A special commercial featuring Schnatter and Hall of Fame quarterback, Troy Aikman, touting Papa’s Chocolate Chip Cookie will be integrated into FOX’s broadcast of NFL games beginning Sunday, Oct. 6. Adding to its list of recent prestigious industry awards, Papa John’s International this week was honored by Nation’s Restaurant News with its 2013 MenuMasters Award in the category of Best Limited-Time Offer for its Buffalo Chicken Pizza. Papa John’s rolled-out its Buffalo Chicken Pizza as an LTO at more than 3,000 restaurants in the U.S. last April. It proved so popular with consumers that the company introduced it again in September to kick off the NFL season. Since then, Papa John’s Buffalo Chicken Pizza has launched in several international markets, including the United Kingdom, Bahrain, Oman, Qatar, and the United Arab Emirates. The MenuMasters Award is the third prominent award Papa John’s has earned for its 2012 performance. In March 2012, Papa John’s was named Brand of the Year in the Pizza Chain Category of the 2012 Harris Poll EquiTrend Study, and in June 2012 the brand was named tops in customer satisfaction among limited-service restaurants in the 2012 American Customer Satisfaction Index (ACSI). It was the 11th time in the past 13 years Papa John’s had achieved that honor. Last year, millions of Papa John’s Papa Rewards loyalty program members flipped over winning a free large Papa John’s pizza when by popular vote they correctly called the coin toss for Super Bowl XLVI. The Official Pizza Sponsor of the NFL and Super Bowl XLVII today announced details of Papa John’s Super Bowl XLVII Coin Toss Experience, including a new twist: each fan will vote “heads” or “tails” as individuals at www.papajohns.com or at the brand’s Facebook page, ensuring a free large one-topping pizza for those who correctly call the Super Bowl coin toss. Papa John’s Super Bowl XLVII Coin Toss Experience is the crescendo of a season-long engagement with NFL fans during which the brand gave away 2 million large pizzas – double the number Papa John’s gave away during the NFL’s 2011 regular season. Momentum built in October when customers were offered a free pizza after making a purchase in celebration of Manning becoming a Papa John’s franchisee, and later when Schnatter and Manning announced “18-Point Sundays,” offering a large pizza to Papa Rewards members for only 18 points (Manning’s number) rather than the customary 25 points. By season’s end, the duo upped the ante even further, offering a large pizza for Papa Rewards members for just 7 points. Peyton’s father and NFL legend Archie Manning, who resides in Super Bowl XLVII host city New Orleans, is joining in on the fun, serving as Papa John’s spokesperson. “It’s indisputable that the coin toss is the first edge-of-your-seat moment of the Super Bowl, so having millions of free Papa John’s pizzas up for grabs makes it even more fun for fans,” Archie Manning said. Consumers can call “heads” or “tails” for the Super Bowl XLVII coin toss through 11:59 p.m. PST, Saturday, Feb. 2, the night before the game, at papajohns.com or Papa John’s Facebook page. Americans who correctly call the coin toss will receive an email Monday, Feb. 4 with instructions on how to claim their pizza. As a bonus, just for voting, fans will get an offer for 35 percent off their next pizza at papajohns.com through February 2. Papa John’s will remind fans about its Super Bowl XLVII Coin Toss Experience now and up to game day via an integrated marketing campaign that includes a national television commercial featuring Peyton Manning and Jim Nantz, digital media advertising, social media (#headsortails), print advertising and more. Official Pizza of the Arizona Cardinals, Atlanta Falcons, Baltimore Ravens, Dallas Cowboys, Denver Broncos, Houston Texans, Indianapolis Colts, Miami Dolphins, New York Giants, New York Jets, Philadelphia Eagles, Seattle Seahawks, St. Louis Rams, Tennessee Titans and Washington Redskins. Papa John’s is tops in customer satisfaction among limited-service restaurants, according to the 2012 American Customer Satisfaction Index (ACSI) released June 19, 2012. Papa John’s achieved the highest score ever by an individual brand in the Limited Service Restaurant category, and it is the 11th time in the past 13 years that Papa John’s has posted the highest score among national pizza businesses. To celebrate this outstanding achievement all 23 Central Ohio Papa John’s restaurants are offering 50% off ALL regular menu priced online orders ALL this week (August 20th-26th) with promo code: thankyou at papajohns.com. In addition to the top overall ACSI rating for limited-service restaurants, Papa John’s score of 83 tied the highest rating in the Full Service Restaurant category. Papa John’s also earned the highest score regarding product quality, service quality and customer loyalty in the individual ACSI ratings for pizza businesses. The ACSI ranking comes on the heels of the 2012 Harris Poll EquiTrend® Study naming Papa John’s as its 2012 Pizza Brand of the Year due to the company’s quality and consumer preference for Papa John’s pizza. Continuing its commitment to “Better Ingredients. 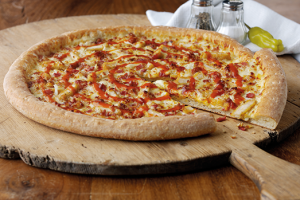 Better Pizza.”, Papa John’s today unveiled nationwide its new Buffalo Chicken pizza – a savory combination of creamy ranch sauce, all-white sliced chicken strips, crispy bacon, fresh-sliced onions and 100% real cheese made from mozzarella, all topped with a tangy, spicy buffalo sauce. A large Buffalo Chicken pizza is available for just $10 beginning today at Papa John’s restaurants nationwide, and online at www.papajohns.com. Buffalo Chicken pizza is a limited-time offering pizza and will be available at Papa John’s restaurants throughout the U.S. through the end of April. Heads Up! 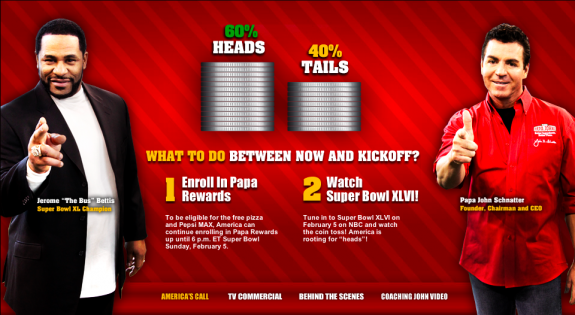 Super Bowl XLVI Coin Toss Lands On ‘Heads’ Giving Free Papa John’s Pizza To Millions! Hey America, are you ready for some free Papa John’s pizza – the Official Pizza Sponsor of the NFL and Super Bowl XVLI? In one of the most anticipated “flips” in history, the coin toss for Super Bowl XVLI landed on “heads” this evening, resulting in a free large one-topping Papa John’s pizza and 2-liter Pepsi MAX for the millions of members of Papa John’s Papa Rewards customer loyalty program. Fans who were enrolled in Papa Rewards as of 6 p.m. ET today will receive an email Monday with instructions on how to get their large one-topping pizza and 2-liter Pepsi MAX. As a special thanks to our customers all Columbus Ohio area Papa John’s restaurants will be offering a Large One-Topping Pizza for only $.46 cents this week only with the purchase of Large Specialty Pizza. America chose which side of the coin based on popular vote the past 10 days at www.papajohns.com. “Heads” prevailed with 60 percent of the vote. 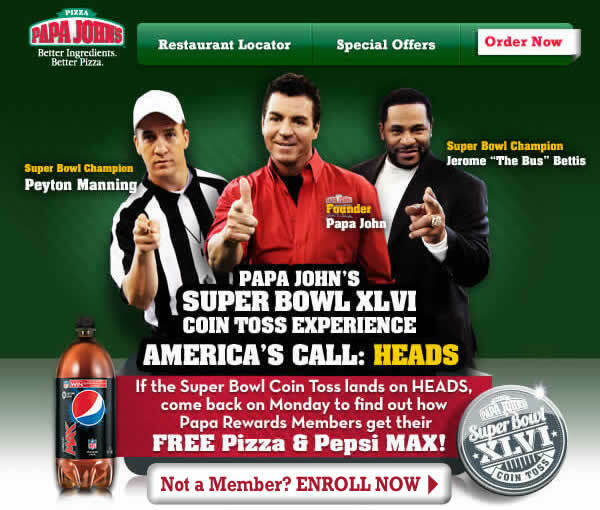 But making the call is just part of Papa John’s Super Bowl XLVI Coin Toss Experience. Americans can enroll in Papa Rewards at www.papajohns.com until 6 p.m. ET Super Bowl Sunday to receive the free pizza and Pepsi MAX if America’s call is correct. Last year for Super Bowl XLV, Papa John’s set a single-day sales record by selling more than 1 million pizzas, driven in part by offering a free large pizza to everyone in America if the game went into overtime. In the fourth quarter, the teams were separated by only 3 points, but the game did not go into overtime. In fact, no Super Bowl has ever gone into overtime. 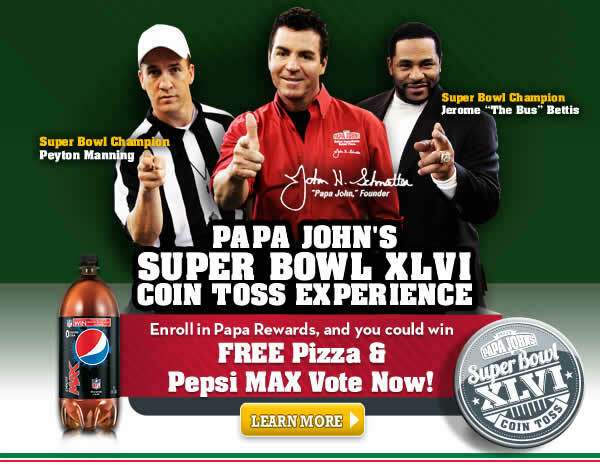 If the coin toss for Super Bowl XLVI lands on heads, each Papa Rewards member will receive an email Monday, Feb. 6, with instructions on how to get their free large one-topping pizza and 2-liter Pepsi MAX. Papa John’s, the Official Pizza Sponsor of the NFL, announced today that it is kicking off the 2011 NFL regular season where it left off at Super Bowl XLV – offering all of America the chance to win a free large one-topping pizza. With the season set to kick off this Thursday, Papa John’s is rewriting the playbook by announcing the first-ever and one-of-a-kind Million Pizza Giveaway to members of its Papa Rewards online customer loyalty program. Beginning today, current Papa Rewards members and consumers who sign up for Papa Rewards at papajohns.com will have the chance to be randomly selected to receive one of the 60,000 free large one-topping pizzas Papa John’s will award each week during the NFL regular season in the form of 20 Papa Rewards points deposited in their account. Consumers can enroll any time throughout the regular season, and can also get information about the Million Pizza Giveaway by liking Papa John’s on Facebook. Papa John’s is in the second year of a multi-year sponsorship with the NFL and is also the Official Pizza of the Arizona Cardinals, Atlanta Falcons, Baltimore Ravens, Dallas Cowboys, Houston Texans, Indianapolis Colts, Miami Dolphins, New York Giants, New York Jets, Philadelphia Eagles, Seattle Seahawks, St. Louis Rams, Tennessee Titans and Washington Redskins.